On my laptop I use Glassfish as my server platform for the Apex Listener. A common problem I see (mainly from trainees trying to plug in my address) is the following error. 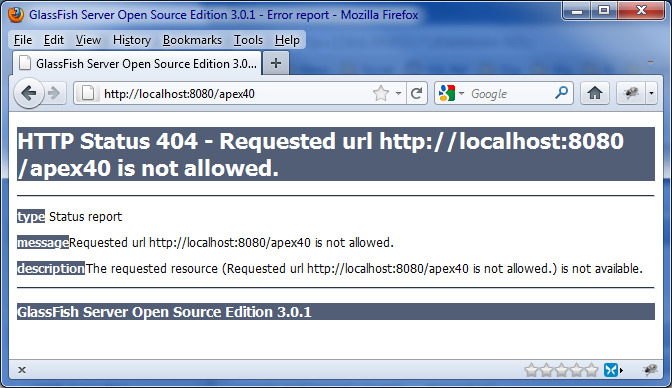 HTTP Status 404 - Requested url http://localhost:8080/apex40 is not allowed. Now this isn't really a problem for me day-to-day because I have a nice bookmark that takes me to the correct location. But next time I try to set-up Glassfish, or I'm having some troubleshooting problems, I'll forget this issue. I don't know if this is solved by some setting - I'm certainly not a web server expert. If anyone has any comments I'd be glad to listen. I was adding this entry so I might also remember in future, and let's just say I passively found the solution, instead of actively looking for a potential one. it was a bit of mission for me to install glassfish server and integrate with APEX 4 in our test machine. But finally I got it working.